Chaitra Navaratri 2019 commences on April 6, and the nine-day Hindu festival will end with Ram Navami on April 14. As today is the first day, goddess Shailputri – daughter of the mountains, is worshipped. Goddess Durga was born in the house of the king of mountains, so she is called Shailaputri (daughter of the mountains). She is always seen riding on Nandi bull. Goddess Shailaputri is the wife of Lord Shiva and has two kids, Ganesha and Kartikeya. Devotees call Maa Shailaputri with names like Sati, Bhavani, Parvati or Hemavati. According to Hindu mythology, in her previous birth, Sati’s father Daksha Prajapati was a proud king who never accepted her decision of marrying Lord Shiva. He organised a yagya and didn’t invite Lord Shankar and when Sati reached to question him, he insulted her husband. Sati couldn’t tolerate her husband’s insult and immolated herself. The goddess has a crescent moon on her forehead, two hands, carrying a Trishul (trident) in right hand and a lotus flower in left hand. She is the goddess of the Muladhara Chakra or the Root Chakra, who upon awakening begins her journey upwards. Shailputri is associated with crimson red colour. Maa Shailaputri is recognized for the determination and achieving impossible feats as she is considered to be Goddess with unlimited power. 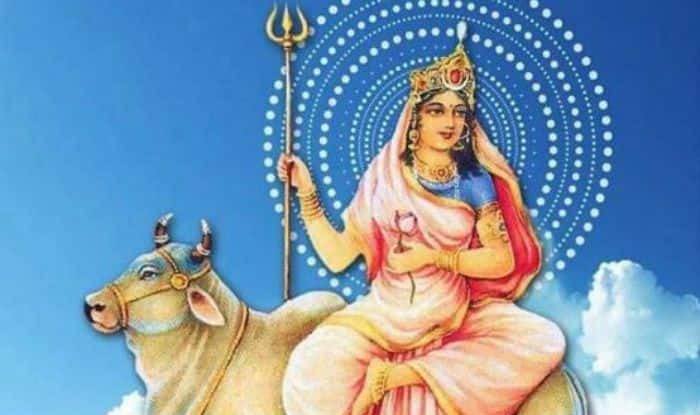 Shailputri Mantra to worship Devi Shailputri – Mantra: Om Devi Shailaputryai Namah ॐ देवी शैलपुत्र्यै नम. Shailputri Prarthana – Vande Vanchhitalabhaya Chandrardhakritashekharam; वन्दे वाञ्छितलाभाय चन्द्रार्धकृतशेखराम्। वृषारूढां शूलधरां शैलपुत्रीं यशस्विनीम्.